This is one of those movies that gave me a perplexing vibe after I was through with it. For a film that was meant to have a collaboration of two countries namely Japan and Thailand, this was slightly controversial. First off, to show a country with its dirt about human trafficking, that’s already one serious issue to dwell on… then add the corruption of government officials at the side lines, well that’s like adding salt to the injury. Nonetheless, this was a great movie to watch, especially if you’re interested in ethical and social issues around the globe. Eguchi Yosuke has always been a great actor and I’m glad he is able to reunite with Miyazaki Aoi on screen for yet another work or rather I should say a BETTER movie this time around. I have already expected top notch acting performance from both main actors including Tsumabaki Satoshi who is part of the supporting cast, and unbelievably they surpassed my expectation. The plot line sound quite simple, a volunteer social worker meets with a journalist and they start working hand in hand to uncover and expose the crime behind the Human Trafficking to help the poor children who are caught in such a hideous crime. What makes this story interesting is that this event is actually happening in real life and by watching this, it raises awareness to other people in other countries. Then add to this the fact that the production setting and cinematography seemed so real in a sense that it almost looked like a documentary, that my heart broke every time I see the children being herded off to the unknown. Lastly, there is the script. The story line is awesome that it makes the whole movie a real work of art. Music wise, I couldn't actually remember much of it, but I would probably rewatch this in the future with some students to use as a tool for discussion on such issues. 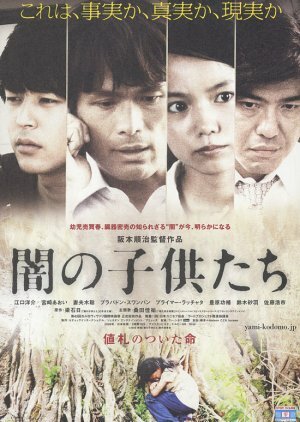 I usually have the habit of predicting drama or movie endings, and usually I’m not mistaken, but when it comes to Yosuke’s films, I am always caught off guard. I had the same feeling when I watched Gimme Heaven’s ending which both main actors where previously in. It was so mind boggling and yet it did make sense big time. I'm really hoping more people will be able to watch this film and I am definitely recommending it.